World Trade Month Luncheon: 17th Annual Miami TradeNumbers - WorldCity, Inc.
For the latest Miami trade data from the U.S. Census Bureau, visit USTradeNumbers.com. 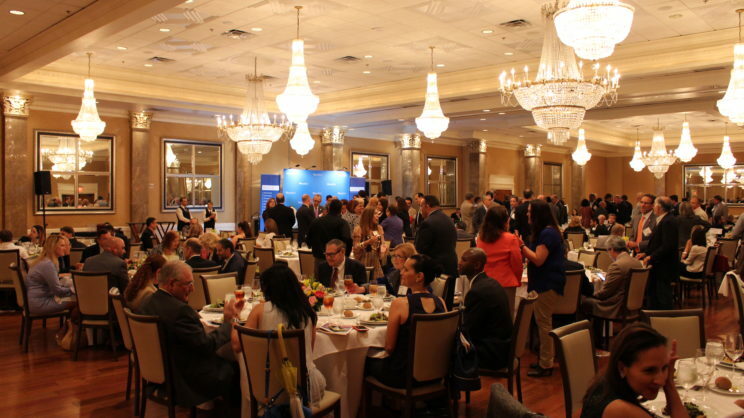 Click here to view our Facebook photo album from the World Trade Month Luncheon and tag yourself! 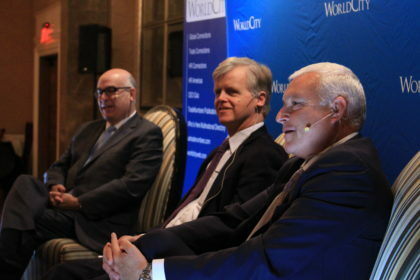 A panel of directors from PortMiami, Port Everglades and Miami International Airport, along with WorldCity President Ken Roberts updated the state of trade in South Florida at the World Trade Month Annual Kick-Off Luncheon. The Miami Customs district’s trade with the world slipped 2.21 percent in 2016, the fourth consecutive year it has been down, which is the first time that has happened in the 25 years of available data. Exports were down 4.23%, while imports grew 0.23%. Ten of the top 15 U.S. Customs districts in 2016 were also down. Emilio Gonzalez of Miami International Airport (left), Steve Cernak of Port Everglades (center) and Juan Kuryla (right) made up our panel at this latest Trade Connections event. The Miami Customs district has usually led the nation in trade surplus, but that honor now belongs to Houston, the nation’s No. 7 Customs district in total trade. Miami is now 12th in total trade, having seen its surplus drop from $25 billion to $7.76 billion, the first time it has been below $10 billion in a decade. 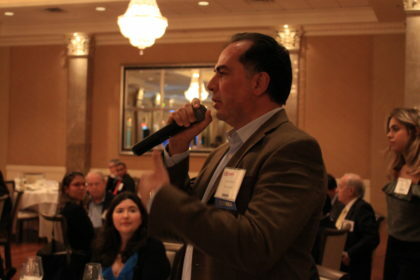 Trade Connections member Juan Gallardo, Director of Terra Capital and Consulting, poses a question to the panel of port directors. Click here for more information on becoming a member! Port Miami Director Juan Kuryla pointed out 50 percent of imported products bought in Florida are coming in from ports outside the state – Savannah, Los Angeles and Long Beach. The panel also noted 2016 was the first time both PortMiami and Port Everglades saw more than one million shipping containers pass through for three consecutive years. 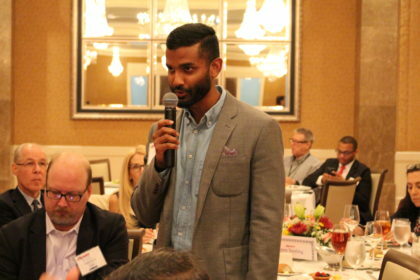 Miles Varghese, Sales Executive at Octopi asks a question to the panel. Plasma and vaccines moved up 13 spots in one year to become Miami’s sixth most valuable export commodity. Those exports grew 189 percent from $475.15 million to $1.37 billion. It was Miami’s fastest-growing top 50 export. Exports of plasma and vaccines to Italy were up $615.36 million to a total of $652.13 million, a whopping increase of 1,674 percent. Exports of plasma and vaccines out of Miami were also up at least 100 percent to handful of other countries, including Argentina, Mexico, Australia, Chile, Israel and Taiwan. Miami International Airport has become a huge player in the space, only the second airport after Brussels, Belgium to become a certified pharma hub by the International Air Transport Association. Gonzalez said the pharma industry actually asked for certification standards to be established to make airports pharma hubs. It took Miami International Airport about 18 months to become certified. It is now reaping the rewards. Those countries are: Brazil, Colombia, Venezuela, Costa Rica and Switzerland. Each has seen its trade with Miami drop more than $1 billion total from 2012 to 2016. Brazil and Colombia, not surprisingly, still rank first in second among Miami’s trade partners. In fact, Miami’s top-nine trade partners in 2016 were identical in order from 2015 rankings. However, Costa Rica was Miami’s third most important trade partner three years ago, before Intel moved computer chip processing from Costa Rica to Malaysia. Miami’s third most important trade partner now is China, with Costa Rica ninth. Venezuela dropped nine positions to 19th in trade with Miami, and Switzerland three spots to 16th. Miami’s $848.55 million exports of gold to Switzerland were a fraction of the $7.13 billion total in 2012. Of the top 50 exports from South Florida to Venezuela, 42 fell in value in 2016, and the value of gasoline imported to Miami from Venezuela dropped 72 percent in 2016. Our next Global Connections event will take place May 19th.